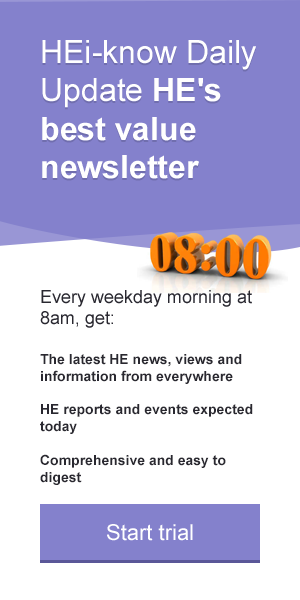 Visitors: Welcome to our live HE news roundup page, which is free to view until 27 May 2016. You can get all of this plus a summary of the day's events and reports, as well as parliamentary activity, direct to your mailbox at 8am each weekday from our Daily Update Newsletter -- find out more. WHAT WILL THE ELECTION RESULTS MEAN FOR UNIVERSITIES? David Morris, deputy editor of WonkHE, examines what "super Thursday's" election results could mean for universities. The Department for Businesss, Innovation and Skills has published interim advice for alternative provider applicants to the government's postgraduate master's loans scheme 2017-18. The government has announced that the £200 million polar research ship to be named after Sir David Attenborough, days before the broadcaster’s 90th birthday. The name voted for by the public on a website inviting suggestons, “Boaty McBoatface”, is to live on as the name of the ship’s high-tech remotely operated undersea vehicle. Keith Burnett, the vice chancellor of Sheffield University, argues that it is increasingly difficult for UK universities to maintain their place in league tables because of diminishing resources. More than 1,000 students at University College London, Goldsmiths, Roehampton and the Courtauld Institute are withholding more than £1 million in rent from their universities in protest over the rising cost of accommodation in the capital. The students union at Queen Mary University of London has called for five speakers to be barred from an event organised by an Islamic society at the institution after leaked documents revealed their extremist backgrounds. Some small and specialist institutions have seen a significant rise in their teaching income, while the English sector overall has lost around £50 million from its teaching grant, in allocations for 2016-17 announced by the Higher Education Funding Council for England. University rankings have become an "informal and unofficial form of regulation", but are not transparent enough to drive a coherent performance regime, Professor Simon Marginson, director of the Centre for Global Higher Education at University College, London, told delegates at the iREG-8 conference on university rankings and international academic relations in Lisbon. Craig Brandist, professor of cultural theory and intellectual history at the University of Sheffield, warns that the forthcoming Teaching Excellence Framework is likely to intensify managerial pressure on academic freedom and micro-management of academics' work. The murder of Cambridge University PhD student Giulio Regeni in Egypt raises questions for universities over their duty of care of doctoral students and their assessment of risk levels for studies in unstable parts of the world, Research Councils UK has warned. The Daily Mail reports that anti-Semitic, Holocaust denying leaflets have been put up at the universities of Edinburgh and Glasgow. The universities are reported as saying they and the police have been investigating and that racism will not be tolerated. HOW INCLUSIVE ARE UK UNIVERSITIES? Six academics give Times Higher Education their views on how welcoming a place academia is if you are LGBT. It follows a recent study by the charity Stonewall which put 12 universities in its list of the UK's top 100 most inclusive employers. The Guardian takes a closer look at the controversial "no-platforming" issue, seen by some as an attack on free speech, where invited speakers are later deterred or banned from speaking at student events. The article examines several cases which have caught the public eye. A recent NUS survey suggested 63% of those who took part were in favour of its no-platforming policy. With so many different league tables being produced for the university sector, how are people expected to make sense of them all? That's the question posed by The Telegraph, which gives a break-down of the main rankings and explains how they are compiled. Times Higher Education has published its latest World Reputation Rankings. Cambridge and Oxford universities are put in fourth and fifth place respectively, behind Harvard, Massachusetts Institute of Technology and Stanford. Asia has increased its share of the top 100 places - with 18 institutions featured this year compared with 10 last year. Phil Baty, the editor of the rankings, says there is a global elite powerhouse at the top but that the balance of power in higher education and research is “slowly shifting from the West to the East". The Times says "Britain’s foremost universities have slipped down world rankings as Asian institutions climb the table", while the BBC reports that "the UK has 10 universities in the top 100 of the world's best when it comes to global reputation, but many have slipped down the rankings this year". Imperial College London is in 15th place, University College London is 20th and the London School of Economics and Political Science is 24th. The Telegraph and the Daily Mail report suggestions that the UK's top institutions are "slipping down the rankings" because "they are forced to focus on diversity and recruiting from disadvantaged backgrounds" and that there is a damaging perception that immigration rules are making the UK less attractive to international students and scholars. Scientists at the University of Edinburgh are working with NASA on a "human-like robot that walks upright and can hold objects in its hands" which could be bound for Mars. Members of the University and College Union working in higher education have voted in favour of strike action at UK universities in a row over pay. Almost two thirds (65.4%) of members who voted backed strike action and over three quarters (77.3%) voted for action short of a strike. The vote follows an improved offer of 1.1% from the Universities and Colleges Employers Association (UCEA). The union’s national representatives will meet on Friday to discuss the ballot result, before a decision is made on what form the industrial action will take and when it will begin. New facilities - including a unique diary unit - will be created at the University of Nottingham as part of a new national Centre of Innovation in Livestock (CIEL), a £27.7m government project which will deliver world-leading research in livestock health and production. A medic and a student nurse write about their work experiences in hospitals – how they related to patients and how the time on the front line helped them make decisions about their future careers. Leicester City's remarkable Premiership triumph may have boosted the city's reputation abroad, according to Paul Boyle, vice-chancellor of the University of Leicester. The vice-chancellor of De Montfort University Dominic Shellard said international undergraduate applications grew about 60 per cent in the current cycle. The NUS urges students to vote in the largest set of elections outside of a general election for years. Failure to reform Northern Ireland’s “unsustainable” higher education funding model will undermine the province’s long-term economic future, a new study by the Royal Irish Academy says. The “unprecedented underfunding” could damage the quality and reputation of its two universities - Queen's University Belfast and Ulster University. Phil Baty, the editor of the Times Higher Education World University Rankings, argues that ranking are not just good for universities, but have a positive impact on nation building. He said that rankings’ simplicity helps focus government attention on education policy, particularly in countries where there are inadequate quality assessment measures for academic standards. An editorial in The Guardian says young people in the UK are being let down by a system which "manufactures graduates" but leaves them "laden with debt, often in employment that neither draws upon their skills nor pays their way". The Times reports on campaigns by several students' unions for gender-neutral toilets at their universities. ARE STUDENTS LESS SENSITITVE TO LIGHT? According to Huffington Post's Young Voices, planners in Brent, London, are saying that students have less "right to light" than other people. It reports that planners have said a new development can go ahead despite the impact on light in student accommodation because residents are transitory. Peter Scott, professor of higher education studies at UCL Institute of Education, writes in The Guardian in defence of students' rights to debate controversial topics. He steps in to the row over the election of Malia Bouattia as president of the National Union of Students. Analysis of Hesa statistics for The Complete University Guide suggests the drop-out rate at universities with the poorest records on retention is higher than one in four. A new study claims that Oxford and Cambridge are "failing" students from poorer homes in their admissions system. Junior academics could commit "career suicide" by carrying out multi-disciplinary research, according to Professor Ian Goldin, of the Oxford Martin School, Oxford University. Speaking ahead of his speech at the Going Global conference in South Africa, he also complained about funding for inter-disciplinary research. The Guardian looks at what action universities are taking to tackle the student gender imbalance in subjects like engineering and psychology, including initiatives at the University of Leicester and University College London. The publication also features an article by Sarah Green who says that the imbalance between men and women at the highest levels at universities will not go unless the sector addresses "the crucial issue of quantity versus quality when it comes to research", which she says disadvantages women. Dean Machin, an associate member of staff at University College London, proposes the introduction of tuition fee caps that vary by subject and institution, in proportion to their relative graduate earning power, following the Institute for Fiscal Studies research showing the wide pay gap between graduates on different courses. A student activist who founded the campaign to remove the Cecil Rhodes statue from the University of Oxford has gloated online about making a white waitress cry, The Times reports. Ntokozo Qwabe wrote on social media that he was “feeling elated” after he and his friend refused to tip a white waitress in South Africa until lands were returned to black people. Sandwich courses are seeing a resurgence in their popularity as students respond to growing demand from employers for graduate recruits with significant workplace experience. Undergraduates at Cambridge are campaigning to break ties with the NUS over its new leader Malia Bouattia’s controversial stance on Israel. A split involving some of the most influential universities in Britain would have a serious impact on an organisation, an Observer feature argues. Campaigners who want the UK to leave the European Union have accused student unions of "deliberately stiflng" debate over the EU referendum. According to Students for Britain, a pro-Leave campaign group, some lecturers are telling students to vote to remain in on June 23. Brian MacCraith, president of Dublin City University, has warned that business-focused universities should be careful to ensure that working with industry does not damage their wider educational and research endeavours. While universities across the world have pushed hard to improve their links to industry and attract external sources of funding in recent years, there are some unacknowledged risks involved in partnering with big business, particularly regarding research, he said. A Leadership Foundation for Higher Education report has concluded that there are few useful studies to illustrate how well UK universities are doing at training and supporting the next generation of university leaders. It bemoans the lack of any longitudinal studies tracking the impact of leadership training over the course of several years. The Universities Superannuation Scheme has a "last man standing" approach which could mean that top universities could end up in an unsustainable position if some of the institutions in the USS get in to financial difficulties, a Times Business piece argues. Cardiff University is to spend £15 million per year for four years on new buildings and refurbishments. WARNING SIGNS AS UNIVERSITIES ENJOY "BOOM TIME"
Former Financial Times education correspondent Miranda Green examines the significant investment in campus developments by UK universities buoyed by rising fee income and low borrowing rates, but warns there are risks associated with this growth, particularly through trends in income from international students. Professor John Cater, Vice-Chancellor of Edge Hill University, looks at the potential long-term impact of student loan repayments now being faced by those leaving university last summer. The Independent lists the top ten universities where students are awarded the highest grades, according to the Complete University Guide. Heidi Alexander, Labour’s shadow health secretary, has called an “opposition day debate” on the government’s plans to scrap NHS bursaries for student nurses and midwives. The debate, on May 4, will be based on a cross-party motion signed by 139 MPs from all major parties, including the Conservative MP and former nurse Maria Caulfield. The University of Bath is to set up a facility in London's Pall Mall to enhance the impact of its academic research and expand its executive education offer. The facility, to be opened in the autumn, will be used for workshops, master classes and networking events with existing and new business partners. Peter Horrocks, vice chancellor of the Open University, argues that lifetime learning must be valued as highly as traditional degrees and part-time and mature students should be given the same amount of support as sixth formers going to university. David Willetts, the former universities minister, said outbound student mobility was essential to the country’s soft power agenda. Speaking at the International Unit's Go International event this week, Willetts said two-way mobility programmes facilitate negotiations with overseas partners. Spending on UK higher education providers increased by 6 per cent in 2014-15 to £31.2 billion, new figures from the Higher Education Statistics Agency show. Some £33.2 billion in income was received by UK higher education in the last full academic year, up from £30.7 billion in 2013-14, an 8.1 per cent rise. CLAIMS THAT ECONOMICS LECTURER HAS BEEN REASSIGNED BECAUSE HE IS "TOO RADICAL"
Alberto Paloni, a Glasgow University economics lecturer whose teaching material has been described as “too radical”, has been stopped from teaching a core degree module, leading to claims of further erosion in the pluralism of economics degrees. He is an expert in post-Keynesian theory. A spokeswoman for the university said the reassign of Dr Paloni came was part of the normal review process. University applicants who want to graduate with a first or upper second class honours degree should try to get in to Oxbridge, according to the latest Complete University Guide (CUG) rankings. The two universities have the highest proportion of the top honours degrees, followed by St Andrews and Durham. An opinion piece in the Guardian suggests that the big debts that English students face could deter young people from less affluent backgrounds. The Times follows up on the FT's story today on universities funding with low-cost loans an "expansion boom" to attract more international students, holding up as an example UCL's announcement on a £280m loan from the European Investment Bank to pay for campus developments. The BBC follows on the Sutton Trust report on graduate debt with a video asking whether a degree is worth the investment. Meanwhile, HEi-know raises the curtain on Media FHE's coverage next week of the British Council's Going Global conference in Cape Town, where a sizeable contingent of UK vice-chancellors and international staff will gather to network and debate a wide range of international HE issues. You can follow our coverage on the Going Global and Media FHE websites and on Twitter @HEGoingGlobal #GoingGlobal2016. A contributor to the Guardian's Academics Anonymous column describes life as an academic suffering from generalised anxiety disorder, with symptoms often triggered by the demands and challenges of being an academic on a fixed term contract. A Nottingham Trent University student's Twitter post went viral when it featured a photo of the title page of his dissertation featuring everyday Millennial slang. The Times reports that universities in London are leading a move by the sector to borrow over £3 billion to fund an "unprecedented era of expansion" and meet booming demand for places from international students. It holds up as an example University College London's announcement that it has secured a £280 million loan, the largest amount lent to a university by the European Investment Bank, to pay for a new campus on the Queen Elizabeth Olympic Park in east London and upgrade and expand buildings on the Bloomsbury campus. University Business also has an article on the UCL loan and campus developments.